Having already walked much of the local area Jan suggested I should use my seniors bus pass and go further afield for my regular Sunday walk. 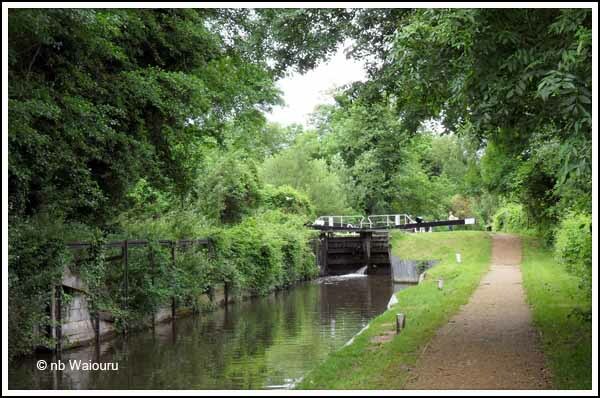 So today I caught the local Black 1 bus to Reading Railway Station and then walked to Caversham Lock on the Thames before walking the towpath back to Aldermaston. The distance was slightly more than 20km and was completed in just under 4 hours so it was a casual walk. The last third was over previously covered ground, however I found the Thames and lower Kennett quite interesting. 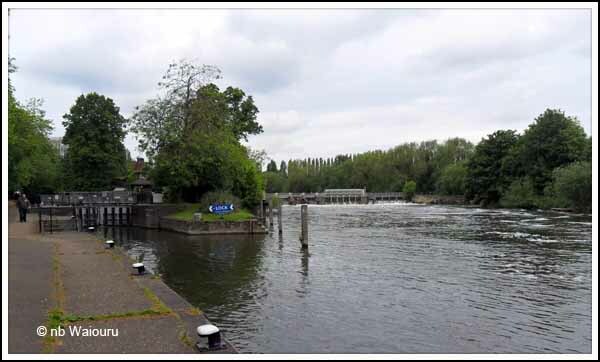 When I reached the Thames I wasn’t quite sure whether to turn left or right to reach Caversham Lock. Taking a guess I turned right which subsequently proved to be the correct decision. 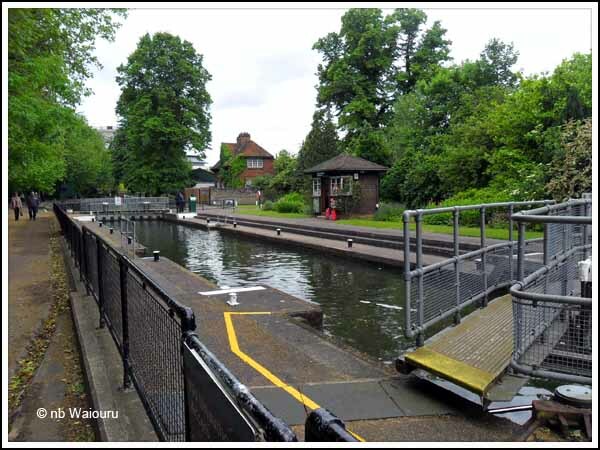 The most noticeable thing about the lock was the adjacent weir which is quite large and had a considerable volume of water passing over it. 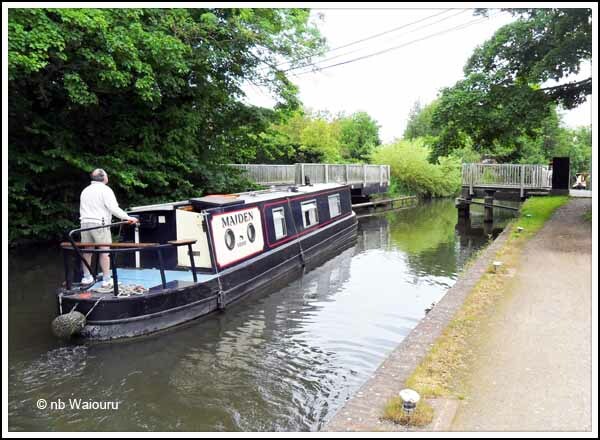 No doubt we will need to pass through the lock at some stage so it was good to view the layout and approaches. The walk along the riverbank to the mouth of the River Kennett was also interesting with a large park on one side and numerous boats moored against the bank. I even found the moorings for the TESCO supermarket which will be quite handy when we pass through Reading on Waiouru. 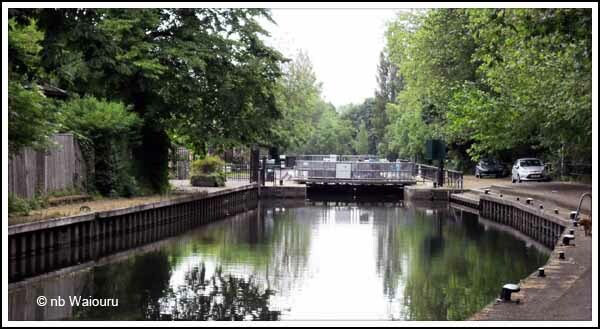 There was nothing spectacular about the mouth of the Kennett or the first lock (Blake’s Lock) which; despite being on the Kennett is actually managed by the Environmental Agency who control the Thames. 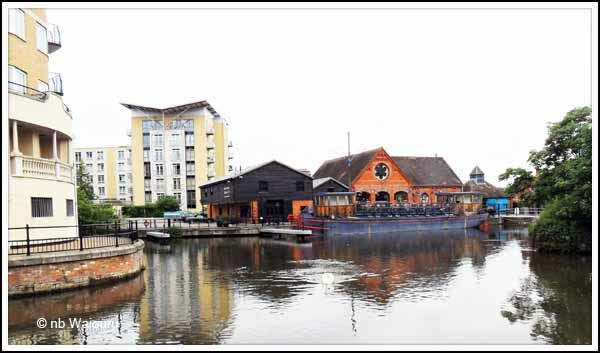 On walking back into Reading via the towpath I noticed there was a small riverside museum and moorings on the opposite side of the canal. It appears there is ongoing work to dredge the towpath side of the canal between Blake’s Lock and the Oracle. 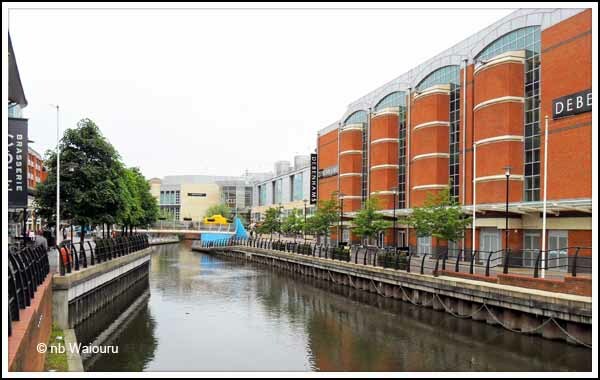 For those not familiar with Reading, the “Oracle” is a modern shopping precinct on both banks of the canal in the centre of Reading. 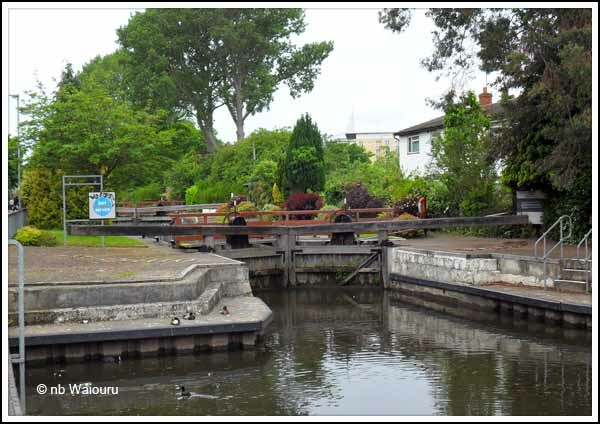 The canal is quite narrow through the Oracle and a one way system controlled by traffic lights has been installed to manage the movement of boats through this section. Beyond County Lock the infrastructure adjacent to the canal turns from commercial to residential. The canal side terrace houses had been built in a straight row roughly parallel to the canal and it was interesting to note the lengths of the back gardens was dictated by the twisting and turning of the canal. Most of the homes had a very narrow street frontage and were 3-4 storeys high. Consequentially they all had very narrow gardens and the shortest of waterfront moorings. The remainder of the walk was through rural countryside which was only interrupted by the roar of traffic on the M4 motorway. There was a lone woman boater at Sheffield Lock and she appeared to be so well organised that I simply took the following photo and kept walking. Note the scalloped sides to the lock! It really was a cool and peaceful day. The sun didn’t seem to be out, however I have noticed since my return to Aldermaston that my face is slightly red. Perhaps it’s windburn! 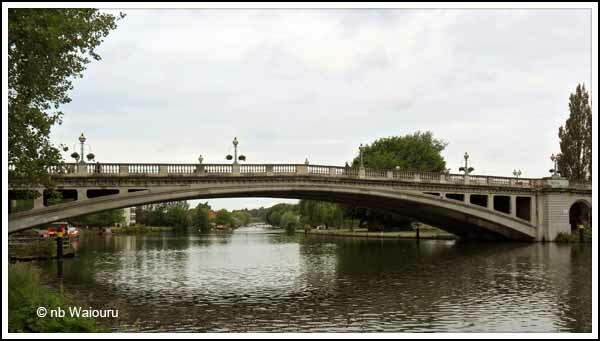 One of the numerous electrically operated swing bridges on this section of the Kennett. 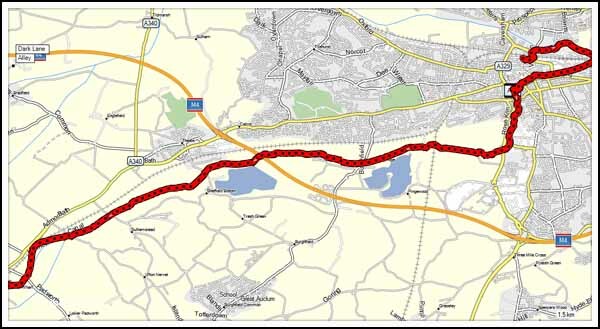 I might take the bus back to Reading on another Sunday and walk some of the Thames before catching the bus back to Aldermaston. While you are in Reading visit the Museum if you at all interested in English History as there is a very realistic recreation of the Bayeux tapestry re the the invasion of William the Conqueror all 70 metres of it. The Oracle is very pretty from the canal side also. 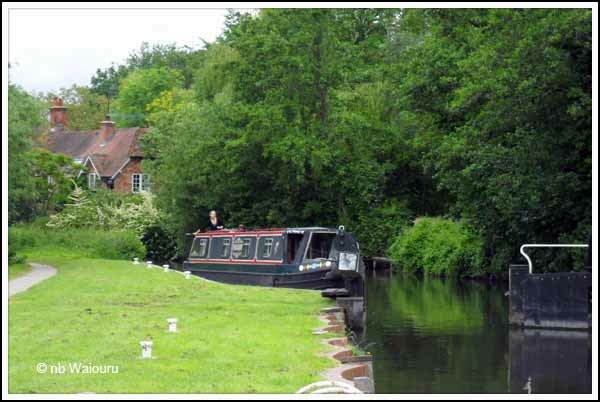 I dare say Jan and I will make a detailed tour of Reading once we take delivery of Waiouru and start our cruising.